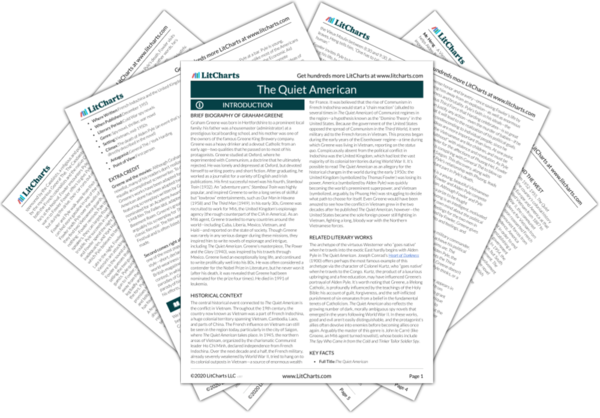 Instant downloads of all 945 LitChart PDFs (including The Quiet American). LitCharts assigns a color and icon to each theme in The Quiet American, which you can use to track the themes throughout the work. Chapter 4 begins a few days after Fowler, Phuong, and Pyle’s night of dinner and dancing at the Chalet. Fowler has flown to Phat Diem to investigate the rumors surrounding the attack on the town. He stands in the Cathedral bell tower overlooking a scene of battle in the distance. From such a distance, Fowler observes, the battle looks picturesque and clean. Fowler then describes what Phat Diem was like before the attack: a quaint village that felt alive, despite not having electricity except in the French offices. Now, however, it is “dead”—all flames and rubble. Fowler’s birds-eye view of the village suggests the world as Pyle sees it. Pyle has only encountered Vietnam in books by York Harding—he’s utterly unprepared of the specificities of life in Vietnam. Fowler, by contrast, has been in Vietnam long enough to realize that the birds-eye view of Phat Diem isn’t accurate—it seems peaceful and simple, but in actuality is complex and often dangerous. Fowler goes on to explain what he learned of the recent attack: Vietminh forces snuck into a Catholic parade and mounted a strike when they reached Phat Diem. Four days later, when Fowler arrives, the enemy was pushed back only half a mile. In the bell tower, the Bishop explains that the townspeople of Phat Diem – Catholics, Buddhists, and pagans alike – have gathered in the Cathedral for shelter. The situation is still a major blow to the French, so to keep it quiet, no journalists were allowed. Fowler made it through because he knew a French officer, and kept quiet about his intentions until he got far enough into enemy territory that officers stopped caring if he was there or not. Talking to the Bishop, Fowler admits that he is not Catholic, and actually hates some aspects of the religion, like confession. Greene reveals a fundamental dilemma of the writer in Vietnam: his most interesting and productive writing is the least likely to survive the censorship imposed by the French military. Thus, Fowler is always fighting with French censors to get information of the war back to England. At times, it seems that Fowler has given up in his struggle—he says that he’s too tired or lazy to investigate war stories, perhaps because he knows that these stories will never be published. In another instance of pessimism, his experiences in Vietnam have made him challenge his own faith in God. Fowler leaves the Bishop and proceeds to a group of officers and soldiers. He introduces himself as an English journalist, and one of the officers, a Lieutenant, tells him that he is welcome to join them as they proceed with “a very small affair.” The Lieutenant offers Fowler his helmet, but Fowler refuses. The Lieutenant leads him, along with the troops, to a large canal, full of dead bodies. Fowler feels a strange sense of revulsion and attraction—and suddenly the Lieutanent turns and asks him, “Have you seen enough?”—seemingly as angrily as if Fowler himself is responsible for the dead bodies. Here we see the impressive, “masculine” aspect of Fowler’s predicament in Vietnam: he is so indifferent to life that he feels no need to protect his own life. This again suggests Fowler’s conflict with Catholicism, where the love of one’s life is understood as a necessary prerequisite to the love of God. Fowler has abandoned his faith and his love for himself at the same time. Like Fowler, the Lieutenant seems to feel a similar sense of guilt, disgust, and nihilism after being surrounded by so much death. The narrative cuts ahead: Fowler has left the soldiers, and is spending the night back at the officers’ quarters. He drinks and plays cards with various officers. The Lieutenant arrives, and tells Fowler that he’ll be given a gun shortly. Fowler seems to accept this, and returns to his card game. A short while later, the Lieutenant announces that Fowler is going to bed, and that he’ll be provided with a gun and matches. This sends a clear signal, and the soldiers leave to go to bed, along with Fowler. Throughout the novel, we see the ways that men adjust to life in Vietnam: here they drink and play cards, two classic “masculine” activities during wartime. Despite the atmosphere of world-weary indifference to the war, it’s clear that the French run a “tight ship”: when the Lieutenant announces lights out, everyone leaves almost immediately. It’s 3 in the morning, and Fowler is lying in his bed at the military base. He hears a sudden noise—reflexively, he reaches for the gun the officers have provided him. He is then surprised to find Pyle standing before him, wearing a helmet. Pyle explains than “somebody” lent him the helmet—Fowler points out that Pyle is very well equipped. It’s illuminating that Pyle wears a helmet while Fowler doesn’t. Fowler, who’s already lived a long life of danger and adventure, has no energy or motivation to protect himself. Pyle, who’s younger and more hopeful, naturally wants to live for as long as possible. This is a potent symbol of Fowler’s apathy and despair. Arn, Jackson. "The Quiet American Part 1, Chapter 4, Section 1." LitCharts. LitCharts LLC, 12 Nov 2015. Web. 23 Apr 2019. Arn, Jackson. "The Quiet American Part 1, Chapter 4, Section 1." LitCharts LLC, November 12, 2015. Retrieved April 23, 2019. https://www.litcharts.com/lit/the-quiet-american/part-1-chapter-4-section-1.